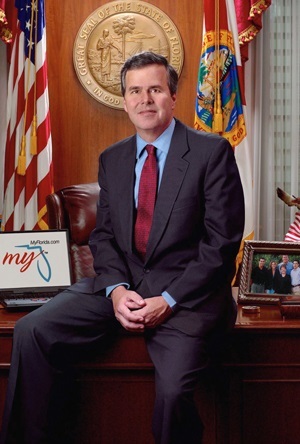 Another Bush in the White House: Jeb in 2012? Obama is slightly below 50 percent in the polls, with a real weakness in the middle of the country, and he’s saddled with a recovery that has yet to produce substantial job growth. Yet there is no true frontrunner in the race to challenge him. It’s hard to imagine an environment better suited for a heavyweight like Jeb to make a run… two years of Obama have taken the edge off W.-hatred, and he’s risen from the depths of his unpopularity near the end of his presidency. Gallup had a poll in December that had Bush’s approval rating very slightly above President Obama’s… [t]he controversies that made the Bush years so venomous have faded, and — partly through the miracle of the accelerated news cycle — 2000–2008 already feels somewhat distant. Jeb probably has a better chance to unite the establishment and Tea Party wings of the GOP than anyone else, certainly a better chance than Sarah Palin or Mitt Romney would seem to have at this juncture. The establishment would presumably flock to Jeb, while he’d have a record of solid conservative accomplishment to sell to the conservative base… he would stand a good chance of avoiding a damaging division in the party. At first glance, this seems like nonsense – surely, just a couple of years after George W. Bush’s departure from the White House, the country could not possibly want to hire his brother as commander-in-chief. After all, people still remember Afghanistan, Iraq, Guantanamo, Katrina, water-boarding, the financial meltdown and all of the other disasters of W’s eight years in office… right? Wrong, apparently. I personally severely overestimated Americans’ attention spans. While I have a great love for my countrymen and countrywomen, one thing that they are not good at is remembering events from even a year or two ago. And it seems like people are already well on their way to forgetting everything bad they used to think of George Bush Jr., and remembering him as a sort of decent, quirky, fun-loving uncle they don’t see much any more but wish they did. Just two months ago, the current president’s approval rating dropped beneath that of his predecessor, who has had a truly remarkable political recovery. Though President Obama’s polling numbers have now risen, Bush’s remain high. In that kind of climate, where the Bush name is no longer a negative factor, Jeb becomes a serious candidate. He was the governor of a major swing state with a substantial Latino population. In fact, he speaks fluent Spanish, and his wife is originally from Mexico. That’s the Latino vote right there. While his education record is now more disputed than it once was, he’s still seen as a forward thinker on school reform. That gets you suburban families. Yet his involvement in conservative hot-button causes like the Terri Schiavo case, and his skepticism of man-made global warming, makes him attractive to the republican base. He’s the kind of candidate who could win votes in the middle and on the right. And honestly, compared to any of the so-called front-runners, Jeb Bush is a formidable candidate. He hasn’t flip-flopped on abortion, like Mitt Romney. He’s not as polarising as Sarah Palin or Mike Huckabee. And he’s got the family’s connections to donors that would mean he could instantly raise millions. If he could get past his family name, he could have a serious shot in 2012. I still don’t think he’ll run – he’s shown no interest in the presidential race this time around, though there’s an outside chance he’ll be a candidate for Bill Nelson’s Senate seat, which would be a good base from which to run in 2016 – but if he did, you certainly couldn’t rule him out.